person will take place and marital discord will be happily resolved. The temple is visited by lacs of devotees, particularly on Angarika Chaturthi (Angariki) - a Tuesday that follows on the fourth day of the lunar bright fortnight. Tuesday as well as the fourth day of the lunar fortnight are considered auspicious days to worship Ganesha, both of which attract a fair number of worshippers to the temple. Ganesh Chaturthi and Ganesh Jayanti is celebrated with great fervour, when more than 5,00,000 people congregate for worship in the temple. Ganesh Chaturthi or Ganeshotsav is the central festival of Ganesha that falls on the fourth day of the bright lunar fortnight in the Hindu month of Bhadrapada (August–September). 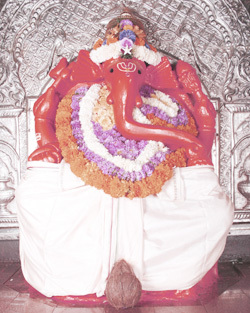 Ganesha Jayanti or Maghi Ganeshotsav is the birthday of Ganesha, which falls on the fourth day of the bright lunar fortnight in the Hindu month of Magha.The temple is often frequented by devotees from Mumbai. The Kalu river, is a small river that flows close to Titwala in its upstream reaches. The Kalu River also flows close to Ambivali, a little farther from Titwala. This river after flowing westwards, in its downstream, receives the small Bhtsal River, which in turn joins the Ulhas River near Kalyan, an industrial suburb of Mumbai. In its further course of 45 kilometres (28 mi), the river receives effluents from several industrial units.